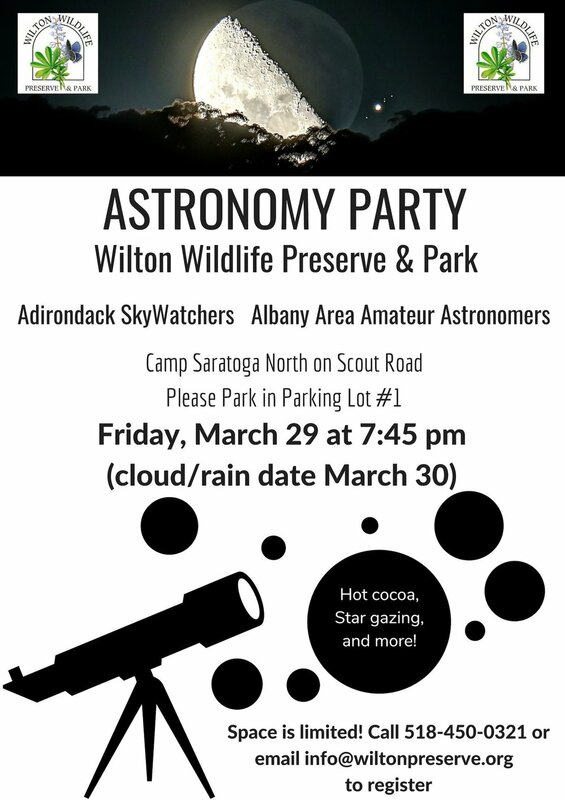 Join Wilton Wildlife Preserve and Park and volunteers from the Adirondack Skywatchers and the Albany Area Amateur Astronomers, Inc. to study the night sky in all of its beauty at their Astronomy Party on Friday, March 29th from 7:30-9pm. There will be telescopes available and experts will be on hand to share their knowledge of the night sky. Please dress appropriately for the weather, as it can get chilly at night! Hot cocoa and refreshments will be served. Registration is required as “space” is limited, admission is free, click the button below for more info on how to register.